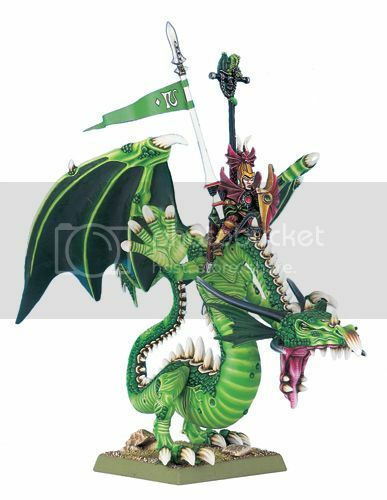 Asarnil the Dragonlord is a High Elf character mounted on a Dragon. Expelled from Ulthuan for a crime that none dare utter, Asarnil comes down upon his enemies with fury unmatched by any of his kin. The character of Asarnil was created as a Regiments of Renown for the 5th Edition rules for Dogs of War. He made his first appearance in White Dwarf #225 (US) along with the rest of the Regiments of Renown, heralding the dawn of Dogs of War as an army. "Victory is a forgone conclusion"
Asarnil will offer his services (for a fee) to the following armies: High Elves, Wood Elves, Dwarfs, Bretonnians, The Empire, Lizardmen and the Dogs of War. The miniature of Asarnil himself was sculpted by Chris FitzPatrick & Trish Morrison a US employee of Games Workshop. The dragon was based off of the High Elf Dragon created by Trish. Victory was finally within our grasp. Then, without warning, a vast green Dragon fell from the skies to bar our way. Its teeth were like scythes, bilious green fumes leaked from its nostrils, and on its back rode a proud warrior. This was the first we saw of Asarnil. The Legend of Asarnil the Dragonlord is known throughout Ulthuan. Asarnil was the son of Aserion, the hero of a thousand battles. From his earliest years Asarnil was brought up in the martial traditions of Caledor. He became a great warrior and one of the few Elves still able to rouse the Dragons who slept beneath the mountains of the High Elf realm. His companion, Deathfang, was one of the greatest Dragons that the Princes of Caledor could still wake from their deep slumber. Together they were all but invincible, and their fame reached far beyond the boundaries of Caledor. During the Great War Against Chaos, Asarnil fought with distinction alongside his brother Dragon Princes. Asarnil commanded them in battle, and it was because of him that Caledor was not overrun during those dark times. After the Battle of the Finuval Plains, Asarnil had been ordered to link up with the High Elf forces marching from Lothern. Once the Dragon Princes arrived, the combined forces of Lothern and Caledor could destroy the last major Dark Elf force in Ulthuan. But before Asarnil could fly to the Phoenix King’s aid, word came that Caledor itself was under attack. Under the command of Asarnil, an entire flight of the Dragonriders sped back through the skies to protect their homeland. In a brilliant assault the Dragonriders of Caledor swept the Dark Elves to the sea, and Caledor was saved. Triumphant, Asarnil headed back towards the rendezvous with the Phoenix King, confident that great rewards and honor awaited him upon his arrival. On hearing that his orders had been disobeyed, Phoenix King Finubar became angry. If his troops had come under attack without the support of the Dragon Princes, they would have faced destruction. When Asarnil and his fellow Dragonriders arrived at the Phoenix King’s camp, no parade awaited them. Instead, Asarnil was summoned before the Phoenix King himself. Enraged, Asarnil declined and swore that he was no longer a subject of the crown of Ulthuan. The response of Finubar the Seafarer was quick and harsh. Asarnil would be stripped of his title and lands and banished from Ulthuan, unless he would face the Phoenix King’s justice. Proud to the last, Asarnil declined. Asarnil was now a Prince without a domain, a lord in exile. He gathered his weapons and armor, mounted Deathfang, and left the blessed island of Ulthuan. Asarnil headed towards the old ruins of an Elf city in the south of the Old World. He found that humans now inhabited the land. His Dragon descended in the city of Remas in the land of Tilea, much to the dismay of the citizens. However, the Prince of Remas realized that such a mighty ally would give them the advantage they needed in their war. He immediately hired the services of Asarnil for the war Remas was waging against the city of Miragliano. With the help of Asarnil and the awesome might of Deathfang, Remas decisively defeated their rivals and brought the war to a successful conclusion. Indeed, such was the terror inspired by Deathfang that most of the men of Miragliano threw down their arms and fled from the field without a battle! In the naval battle of the Siren’s Rocks, Asarnil and Deathfang destroyed Miragliano’s entire fleet, and ended the city’s supremacy at sea. Since those days the proud banner of Asarnil has flown over countless battlefields in the Old World. Only the greatest Princes can afford the exorbitant fee of the Dragonlord, but a general calling upon Asarnil is almost guaranteed to be victorious. In his heart of hearts Asarnil still dreams of returning to Caledor in triumph with the riches he has won, but for now his lance and sword are for hire. Motto: Victory is a forgone conclusion. Battle-cry: “Wahnil, wahnil!” is the battle-cry of the Caledorians, calling for Vengeance and Death. Appearance: Attired in all the splendor of the Dragon Princes of old, Asarnil and his Dragon are a truly magnificent sight on the battlefield. Glittering ithilmar armor and shining gems combined with the sheer presence of the Great Dragon Deathfang are unforgettable – if you survive to tell the tale. 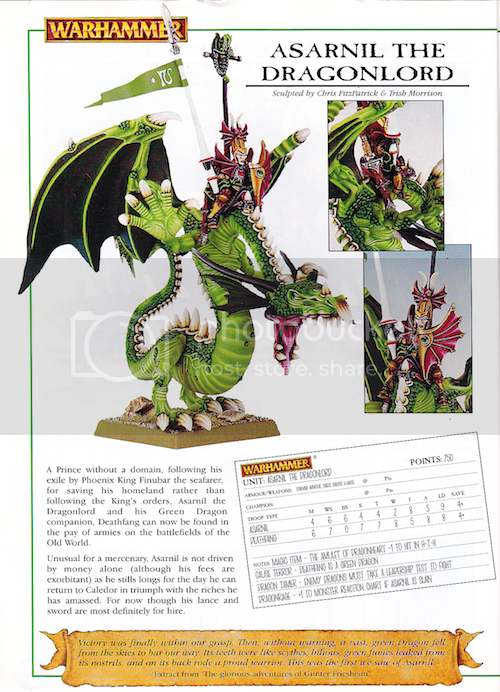 For Hire: Asarnil the Dragonlord can be hired as a Rare Unit in Dogs of War armies. Note that he will take up one of your Hero slots as well as the Rare Unit slot. Alternatively, he can be hired as a Rare Unit (and he will in this case take two Hero slots as well!) in one of the following armies: High Elves, Wood Elves, Empire, Dwarfs (when he’s feeling generous), and Lizardmen. Amulet of Dragonheart (Enchanted Item): This amulet was one of the potent artifacts made by Caledor the Dragontamer for the Elven Dragon Princes. It is said that the gleaming gem hanging around Asarnil’s neck is a stone found at the heart of a mountain, blessed by Caledor the Dragontamer himself. The dazzling light of the Amulet of Dragonheart makes the shape of Asarnil and his Dragon appears blurry and vague, as if glanced through a haze. Asarnil and Deathfang have a 5+ Ward Save against shooting attacks. In addition, the power of the amulet is extremely disorienting at close range. Enemies facing Asarnil and Deathfang in close suffer a -1 to hit penalty when making attacks against either of them. Dragon Armor: Asarnil wears an ancient suit of Ithilmar armor and which has powerful enchants to protect its wearer from harm. The Dragon Armor is a suit of heavy armor including a shield which allows the wearer to re-roll failed armor saves. In addition, the wearer is immune to fire-based attacks. Valor of the Ages: Asarnil is a High Elf and can re-roll psychology tests against Dark Elves. Speed of Asuryan: Asarnil has the Always Strikes First special rule. Note this does not apply to Deathfang. Deathfang: Deathfang the great wyrm is an ancient Great Green Dragon, the last of a race of dragons that is an offshoot of the Star Dragons. Asarnil’s loyal Dragon is a large target, can fly, causes terror, and has a S4 Breath Weapon. Any unit take casualties from this breath weapon must take a panic test. Dragon Tamer: The Elves of Caledor have a natural empathy for dragon-kind that is recognized by all Dragons (of any type: evil-aligned Dragons, Chaos Dragons, etc). if a High Elf character riding a Dragon is fighting in hand-to-hand combat against another Dragon then the enemy Dragon must take and pass a 2D6 Leadership test before it attacks. This test is taken in the same way as any other Leadership-based test such as panic, fear, etc. The test therefore uses the Dragon’s Leadership characteristic if unridden, the rider’s Leadership if ridden, or the General’s Leadership if he is within 12”. This test is only taken once at the start of the combat, and the enemy Dragon will either fight for the duration of the combat or refuse to fight for the entire combat. If a Dragon refuses to fight it will not strike blows or use its breath at all. However, a Dragon will only refuse to fight so long as it is not attacked itself. Should the Dragon be attacked it will always fight back. Dragonrage: Deathfang is Asarnil’s loyal companion. Should Asarnil be slain, add +1 to the dice score on the Monster Reaction chart for Deathfang. If you roll a 6 then you may choose any result you wish.